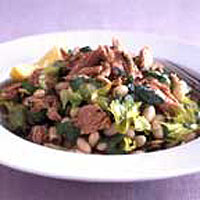 "I love the tuna and bean starter that Italian restaurants often serve," writes Kate Fell, by email. "I've tried recreating it but I don't know the recipe, and I find that when I cook the beans, they tend to break up. Can you help?" We went to Tuscan cookery writer Ursula Ferrigno, who says "the combination of tastes and textures in this delicate salad is delicious. To prevent breaking, make sure the beans are not too old and always soak them overnight." Drain the beans and put in a large pan. Cover with plenty of fresh, cold water and add the rosemary, bay, thyme, parsley sprigs and garlic. Bring to the boil, reduce the heat and cook for about 1½ hours or until the beans are tender. Drain and discard the herbs and garlic. Put the tuna in a bowl and break it into chunks. Add the warm beans and celery, along with the lemon juice and parsley. Season well, drizzle with the extra virgin olive oil and toss to mix (if you dress the salad while the beans are still warm, they absorb all the flavours of the dressing). Serve the salad at room temperature with lemon wedges.